What is the Best Free Resource for Your Mobile Repair Business Website? So you built a great website, and you feel like it is doing its job. You are satisfied with how well it ranks on the search results pages and you are getting some decent leads. That is fantastic, and you are doing better than a lot of businesses with a less effective web presence. But how do you know if your site is really a peak performer? The simple answer is to measure it because that which can be measured can be improved. You don’t need to be a web developer in order to manage or monitor the traffic on your website thanks to some very robust and free resources available to all website owners and managers. Today we are going to discuss two of them: Google Analytics and Hubspot Free. If you have ever dabbled with SEO (Search Engine Optimization) or sought ways to boost your web traffic, you have probably tried or at least heard of Google Analytics. 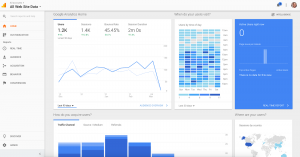 Whether you sign up for an account or not, Google is tracking all kinds of metrics on your website and they provide this data to you for free in a dashboard called Google Analytics. But despite all the collective genius at work at Google, some people find many of their tools very hard to work with, clumsy, and not very intuitive. There is certainly some valuable information in Google Analytics, but the information can be very difficult to interpret or even put into action. Google Analytics allows you to track visits to your site, how long they stay on your pages, bounce rates, what percentage of your traffic comes from various devices, what times of day are the most popular, and a whole lot more. If you are very analytical, you might really enjoy clicking through your Google Analytics statistics and clicking all the tabs on the left bar to learn all about the most granular metrics that Google is tracking on your site. For the most part, small business website owners just want to track and see at a glance if the visits are increasing month over month, and if their web leads are increasing month over month. If you have a solid SEO and or blogging strategy in place, you may want to see what blogs are bringing in visitors, and for those who convert from visits to leads, what the typical behavior pattern is for a buyer (the so-called “buyers journey”) through your website. Well if that describes you, check out an amazing and totally free tool called Hubspot. Hubspot is credited with inventing the concept of Inbound marketing which is a system of content designed to attract a visitor to a website and eventually convert that visitor to a lead through a series of steps. The ultimate goal is for that visitor to hit on a particular item on your site where they are willing to leave their contact information to receive an email or a download link. Once you have that information, your anonymous visitor has now become a self-identified viable sales prospect. Like all software-as-a-service providers, you must pay for Hubspot in order to have access to all of its features, and Hubspot is not cheap. Luckily though, they have released a free version that gives you a pretty darn good set of analytic tools that are easy to implement and easy to understand. 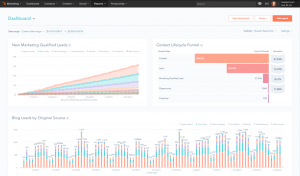 With Hubspot Free, you can track visits month over month (or even week over week) and you can track lead conversions month over month. You can track your top blog posts, landing pages, emails and contacts all in one very easy to read dashboard. If you take the time to set everything up correctly, you can learn a lot about your website and how customers interact with your site without having to spend hours interpreting a bunch of hard to understand charts. The novice user may need to spend some time watching tutorials to learn how to set up their Hubspot correctly, and set up may take a half a day, however, a more intuitive user could have everything set up in just a couple of hours. Installing Hubspot is not as easy as Google Analytics, and you will have to install some code. By contrast, for Google Analytics, all you need to do is sign up for an account and prove that you are the site owner. If you have a WordPress site, there are tools available such as plugins to install the code easily to your site. Otherwise, you can reach out to your web development company to add the tracking code. If you want your Mobile repair business to succeed online, you need to deal with SEO at some point. The point of this post is not to teach you about SEO, or even convince you that you need to manage it, but rather to help you find the resources you need to begin to measure and manage your site in order to make the right decisions to optimize. 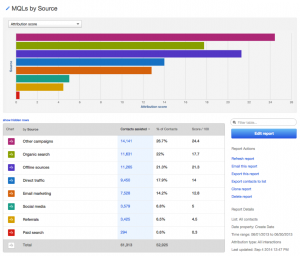 There is no reason why these tools have to be mutually exclusive, and if you use them both, you have the ability to see what the trends are at a high level with Hubspot and you can dig deeper to see specific performance metrics with Google Analytics.